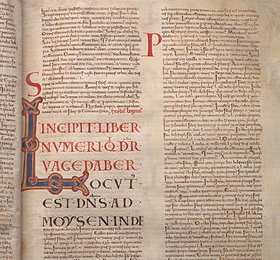 Detail of a page from Leviticus in the Codex Gigas, a medieval illustrated manuscript. This week’s text raises our attention to holiness. In the process, I’ve noticed two questions I’ve been struggling with lately—who are we, and what does it mean? As Moses relays these codes for holiness, he begins with identity: “You shall be holy, for I the Lord your God am holy” (19:2). Earlier, another element of their identity grounds holiness: “you shall not do in the land of Egypt, where you lived, and you shall not do as they do in the land of Canaan, where I am bringing you” (18:3). The vision for holiness that arises reaches far. In this chapter alone, it addresses how Israel will rest and worship, harvest and trade, and speak and make judgments and respond to wrongdoing. And identity justifies all of these. Notice the refrain repeated throughout: “I am the Lord your God.” Later, Israel is called to “love the alien as yourself, for you were aliens in the land of Egypt: I am the Lord your God…, who brought you out of the land of Egypt” (19:34, 36). If what it means to be God’s people in the Levitical imagination is formed by Israel’s experiences in Egypt and Canaan, what does holiness mean for us? One way to answer, and I think this is a good one, is that we are Christian and that means we should reflect Christ. The implications of justice and compassion and mercy reflect the codes we’ll study this week. But I wonder, too, if this is honest enough. No one is just a Christian. We are all from specific times and neighborhood and families and churches. Remembering the role of the exodus in Levitical holiness reminds me of this. My southern Baptist tradition has been shaped by those who supported slavery on the basis of Christianity. At the same time, among my neighbors, there are different Christianities, even relationships to the exodus, that have been profoundly shaped by different memories of slavery and freedom. What does holiness mean, then, when our community’s identity and understanding of what it means extends beyond a single source? I don’t know. Leviticus doesn’t give the answer, but it suggests a way to start responding. Contemporary scholarship holds that the Torah comes from four sources—four separate theologies, histories, and goals. Closer reading shows even these sources to be the products of communities disagreeing, compromising, and developing over time. What emerges is not a single story but many stories about who Israel was in its earliest days being examined and pieced together in a way that helps their community of faith move closer to God and each other. • How has your sense of holiness been shaped by your communities? What are the values to these understandings? What are the limits? • Where are there differences in your religious communities? What accounts for these differences? • How might our sense of holiness, and our commitments to mercy and justice, be expanded by the witness of Christian communities different from our own? There is good reason to believe that four collections of early sacred traditions have been combined to produce the present pentateuchal account. The activity of these four groups (“schools”) of collectors may span a period of as much as five hundred years. Leviticus is part of one of those collections. It has come to be called the Priestly source (or Priestly Code, or Priestly writer, sometimes designated as “P”). This proposed collection of materials, arranged in a meaningful chronological story line, begins with a creation-story (Gen 1:1–2:4a), skips to chapter 5, and then occurs intermittently thereafter through the books of Genesis and Exodus, then the entirety of Leviticus, and finally most of Numbers. “P” has preserved some of the most memorable literature and profound theological thinking that is to be found in the Hebrew Bible. Without its guidelines, one may doubt that Israel/Judah would have survived the great crises during which the material emerged. The other proposed pentateuchal sources are: (1) “J,” or “the Yahwist”; (2) “E,” or the “Elohist”; and (3) “D,” or the “Deuteronomist.” The sources J, E, and D do not occur in Leviticus, but J and E will surface sporadically in the book of Numbers. The source D is largely limited to Deuteronomy…. It is doubtful, however, that the appearance of “P” was that abrupt or its contents so quickly completed. Rather, its origin and developments were likely more complex and gradual, along the following lines. Lloyd R. Bailey, Leviticus–Numbers, Smyth & Helwys Bible Commentary (Macon GA: Smyth & Helwys, 2005) 14–15. The Hebrew word translated “holiness” is qōdeš and connotes separateness or distance. The word qdš occurs in several ancient semitic languages with apparently the most elemental meaning being that of “separateness.” The etymology of the word is uncertain, but at its earliest stage it already had come to have its full meaning in a religious context. Normally in ancient semitic languages, including biblical Hebrew, a noun derives its meaning from its underlying verb. The reverse may be true for qōdeš. The verb qādaš simply mans “to be qādoš [holy].” So the term qōdeš has to do with a feeling, a dynamic state, separated from action; a feeling of separateness, differentness, and remoteness. In the ancient world, as in the OT, the idea of morality was not at all involved. By means of this word, dealings are made with the primitive, primary, and basic reactions of humanity to the mystery over against which all of human life is set. All sacredness comes from God, for God and God alone occupies and sustains the realm of otherness. Holiness in this sense is not one divine attribute, even the most significant; in the most technical sense, this is the only pure quality of God. God acts out of such attributes as love, righteousness, etc., but only one attribute is indicative of the nature of God. When the Lord swears by God’s own holiness (Amos 4:2) the oath rests upon God’s essence. The Holy is insulated from the ordinary. Moses was admonished, “Do not come near; put off your shoes from your feet, for the place on which you are standing is holy ground” (Exod 3:5). Consequently, Mount Sinai, while awaiting the divine visit, cannot be touched upon penalty of death (Exod 19:12). Karen Randolph Jones, “Holiness in the Old Testament,” Mercer Dictionary of the Bible, ed. Watson E. Mills et al. (Macon GA: Mercer University Press, 1990) 383.